While many audiophiles nirvana is a large, floorstanding speaker rated to reproduce frequencies from DC to UV, my quest has been to find a really good small speaker. Thats partially due to the fact that where most people have radios, I have stereo systems -- four at last count, three of them in rooms where big speakers just wont work. Ive been through a bunch of decent small speakers over the years, beginning with the Advent 3 (bought in 1980 for $70 and enjoyed for many years), and continuing through PSBs Alpha A/V and Mini, KEFs Coda 7 (in its day, the best-selling speaker in Europe), and my favorite, the Celestion 3, the reference speaker for my office system. So I looked forward to reviewing Usher Audios S-520 ($479 USD per pair). The S-520 is Ushers entry-level model: a small, two-way bookshelf speaker with 1" dome tweeter crossed over at 2kHz to a 5" mid-woofer, and a front port (a smart move for a bookshelf speaker that might actually be used on a bookshelf). My review samples were finished in what Usher calls white and what I call ivory. While Im not enamored of the color (black, red, yellow enamel, and natural birch are also available), the finish is flawless -- as fine as Ive seen on any speaker. The S-520 is about 12" high, just over 7" wide, and 10.5" deep, and is fairly heavy at 15 pounds. Unusual for an entry-level speaker, it can be biwired and has hefty binding posts. According to Ushers specs, the S-520 is not particularly sensitive, but 86dB/W/m is not an unusual sensitivity rating for a small speaker. Its claimed frequency response is 52Hz-20kHz, +/-3dB. For this review, I used the S-520s only in my office system: Sangean HDT-1x AM/FM/HD tuner, Onkyo DX-6800 CD player, and JVC F-41 turntable with Grado Green cartridge, all feeding a McIntosh C-27 preamplifier and Carver TFM-15cb power amp. The systems usual speakers are Celestion 3s ($299/pair in the mid-1990s, since discontinued). For deep bass, I call on an Advent ASW-1200 subwoofer ($199, discontinued) fed directly from the McIntoshs center-channel output, so its totally independent of the satellite speakers. Speaker cables are 6 lengths of 12-gauge stranded copper -- nothing fancy. The Ushers were set on 31"-tall MDF stands from Sanus Systems. I found the S-520s not at all fussy about positioning in my room, but for nearly all of my listening they were 18" from the front wall and about 5.5 apart. I found I didnt need to toe them in -- their horizontal dispersion was very good. Ive always loved the Celestion 3s effortless reproduction of everything but really hard rock, but the Usher S-520s beat them. The crossover from the mid-woofer to the tweeter was seamless -- each S-520 provided a near "point source," and the overall sound was extremely sonorous and of a piece. The S-520 also had slightly greater bass extension than the Celestion 3: when I compared the two without the subwoofer, the Ushers always gave more bass response. But in another regard, the Celestion and Usher were very close: the overall reproduction of each was quite smooth. I particularly liked the Ushers reproduction of male voices, which sound nasal through many speakers. Ive always considered the Celestion 3 to be about as good as any small speaker Ive heard at reproducing the male voice, but the Usher S-520 was better -- its reproduction had so little nasality that it simply wasnt a factor in my listening. I first noticed this with radio DJs, and confirmed it by listening to singers such as Mel Tormé and Frank Sinatra. Very impressive. I use "You Can Call Me Al," from Paul Simons Graceland [CD, Warner Bros./Rhino R2 78904], for many reasons: lots of deep percussives; the pennywhistle break; the complex bass part; the strong brass; and Simons vocals and guitar. Without the Advent sub there wasnt much low bass, but what the Ushers did reproduce was solid and realistic. Adding the sub at a low level just filled out the lower registers nicely. The Usher has what British reviewers call "slam": it handled transients extremely well, without lag, or any sense that the speaker was falling behind what the amplifier was sending it. The Celestion 3, by comparison, is good, able to reproduce most transients nearly as well as the S-520, though not quite as well. With this track, the clear winner was the Usher S-520. Another song with great production values is Maureen McGoverns "Anyone Who Had a Heart," from Baby Im Yours [CD, RCA Victor 60943-2] -- its a tour de force for McGovern and producer Ron Barron. "Eating the mike" means that a singer is practically swallowing the microphone. It makes guys voices sound deeper, and womens sound more intimate. On this track McGovern doesnt so much eat the mike as devour it -- the sound is intense and vibrant. Her accompaniment is largely piano, bass, and drums, with a smattering of other instruments, and the bass and percussion are recorded intensely "hot." For most small speakers, that would mean smeary sound, and with all the hoo-hah on this track even the Celestion 3 sounds slightly congested. The Usher S-520 handled it all with aplomb. Again: Advantage: Usher. Compared to Maureen McGoverns big and meaty sound, Gordon Lightfoots voice on his cover of Kris Kristofferson and Fred Fosters "Me and Bobby McGee," from Lightfoots If You Could Read My Mind [LP, Warner Bros. RS 6392], couldnt be more different. Ive always loved this recording for Lightfoots mellow voice, Ry Cooders bottleneck guitar, the heavily reverbd kneeslaps, and the recordings overall intimacy. Lightfoots interpretation is fine, and the stereo soundstage is fabulous. With this track, the Celestions and Ushers were fairly close. Both offered a bit of mellowness that may or may not be part of the recording (my combo of JVC turntable and Grado cartridge might have played a major role in this). The Celestions added a very slight nasality, the Ushers a more mellow sound. Interestingly, the guitars sounded slightly more realistic through the Celestions, the echo just a bit more spacious. But I wouldnt trade one pair of speakers for the other. Ive found that, in reviewing a loudspeaker, how it handles transients is important: if theyre reproduced well, I usually find that many of the speakers other attributes are good as well. And one-hit wonder Timbuk3s "My Futures So Bright, I Gotta Wear Shades," from Greetings from Timbuk3 [LP, IRS 5739], has transients in spades -- as well as killer harmonica and electric guitar solos. This track was a bit more subdued through the Ushers, more mellow and laid-back -- the Celestions were slightly more forward and, again, somewhat more nasal. It was a matter of taste. "Finally Found a Reason," from Art Garfunkels Fate for Breakfast [LP, Columbia JC 35780], also showed off the Ushers. As with several other cuts I played, the S-520s were a bit mellower, the Celestions more forward -- producer Louie Sheltons guitar accompaniment sounded more real through the Ushers, as did the backing singers. Here, I definitely give the nod to the S-520. Another cut Ive used for years is "Bali Run," from Fourplays eponymous album [CD, Warner Bros. 26656-2], because it has a lot of percussives both high and low, and a lot of really low bass runs. Again, the Usher demonstrated slam superior to the Celestions. Mind you, both speakers were good, but the Usher did a better job of discriminating among the really fast, tight instrumental voices, and had just that extra bit of bass response: when the subwoofer wasnt there, their sound was just a bit fuller. Something new in my reviewing mix is Isaac Hayes "Theme from Shaft," from the Stax box, found on a compilation disc created by a friend. It features hot bass, strong horns, and insistent cymbals. Many people now know Hayes only as the voice of "Chef" on Comedy Centrals South Park, but those of us a bit older are most familiar with his magnum opus, the soundtrack to the 1971 film Shaft. Hayess voice is extremely mellow, but it so well complements the female backup vocalists. This track has a lot of very hot vocals, and the Ushers just got out of the way and reproduced them flawlessly; the Celestions were a bit more in my face. Overall, the Ushers provided the more realistic reproduction. I then swapped Shaft for Schubert: to be precise, the latters Piano Quintet in A Major, the "Trout," performed by the Cleveland Quartet with pianist John OConor [CD, Telarc CD-80225], and concentrated on the final movement, Allegro giusto. The Usher S-520s offered a very lush sound, even more so than the Celestion 3s, and the instruments sounded closer. Again, this will be a matter of taste; for different reasons, I like both. But the Ushers did chamber music really well. I then popped in Erich Kunzel and the Cincinnati Pops recording of Leopold Stokowskis orchestration of J.S. Bachs "Little" Fugue in G Minor, from The Fantastic Stokowski [CD, Telarc CD-80338]. Ive used this fabulous recording for more than a decade to test the mettle of speakers large and small, and the Ushers -- with some help from the Advent sub -- more than did it justice. The piece begins with a single oboe, then builds to full orchestra, with lots of bass and highs. The recordings articulation of individual instruments is amazing, and the Ushers gave each its full due. Listening to this track through the Celestions, Im in a really fine concert hall; through the Ushers, I was in Cincinnatis Music Hall, where this disc was recorded, and which favors the strings. Stokowski knew this -- he was music director of the Cincinnati Symphony when he wrote this arrangement. The Ushers definitely needed a subwoofer to reproduce the full range of orchestral recordings such as this, but within their frequency limitations they did a fine job. Each section was where it should be, and the soundstage was spot on. Its rare that a small loudspeaker can provide such excellent sound. In a word, the Usher Audio S-520 sounded fabulous. Is it the nirvana of small speakers? Maybe not quite. But its the closest to my goal of finding a really good small speaker that Ive heard. Its reproduction is detailed, yet still able to produce a full sound in which the instruments that are supposed to blend (say, massed strings) come out sounding as one -- and its finish is worthy of a top-of-the-line speaker. Yet $479/pair cant be considered egregiously expensive. 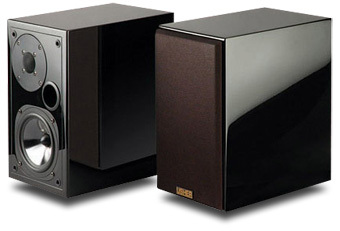 The Usher S-520 is the small speaker to seriously consider.